I love jewelry. It's a wonderful way to add a touch of class to any outfit, even if you are a jeans and tee girl like me. 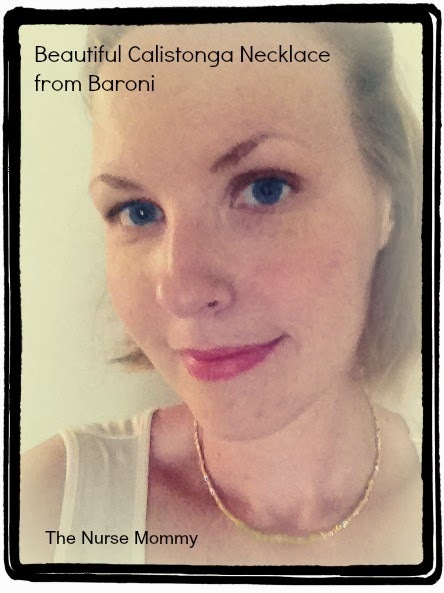 I have reviewed Baroni Jewelry in the past and loved the beautiful butterfly necklace I received. 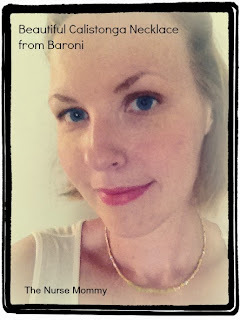 I recently asked Baroni to allow me to review an item from their new fall line and was sent to beautiful Calistoga Necklace. I opted to review this because my wedding set is yellow gold, and the green in the necklace reminded me of my birthstone, the paradot. It is also just a majestic looking piece that I have fallen in love with! The jade colored stones with go with my entire fall wardrobe, and will make every outfit pop! "Gold plated pyrite shimmers next to olive jade stones. Wear individually or in multiples to evoke the rustic luxury of Calistoga. 24K gold plated"
There is just something about yellow gold that makes it look more fallish, right? 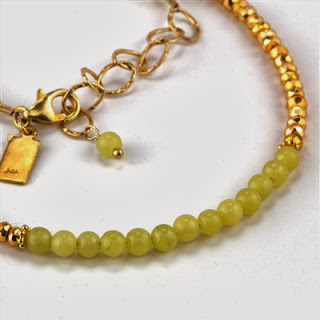 When the description says the pyrite shimmers next to the olive jade stones, you cannot imagine just how shimmery it is without seeing this beautiful necklace in person. No picture or description does it justice. It is an understated yet stunning piece and will look fabulous with v-neck sweaters this winter. Baroni offers quality products behind their name. The necklace I received in the spring is still as beautiful and shimmery as it was when I first received it. The selection at Baroni is amazing, so if you are looking for the perfect gift this holiday season, look no further than Baroni. We will be hosting an Ultimate Prize Pack giveaway to celebrate our 5th Birthday that will include the Calistoga necklace in the grand prize. Giveaway begins 10/16. Take a look around Baroni and then comment below telling us what your favorite piece is! Disclosure: No compensation was received for this post. The Nurse Mommy blog will always provide honest opinions, beliefs or experiences on products reviewed. We will only recommend products or services that we feel are of benefit to our readers. If you have any questions about this review please contact me at nursemommypaige at yahoo dot com. I think that this is my favorite piece: http://www.baronidesigns.com/Ruby_Long_Link_Cluster_Disc_Charm_Oval_Necklace_p/gg-n-05-g-ru.htm. I like the princess kids necklace. The Elegant Elephant Necklace looks very nice!